Description: These SD70ACe 's of Dennis Washington's are something else. They are sprouting up all over Livingston. Description: These aren't DPU's, they are MANNED mid train helpers! Description: 3 4400 units + 5 4300 units.... Thats ALOT of power! 34,700 HP to be exact. Description: A play on Hyndman Helpers Shove Harder" a B&O-era bumper sticker that my dad has. Whrere he got it from, I'll never know. Description: The "black fog" has clouded out the sun as the mid-train helpers crest the summit. 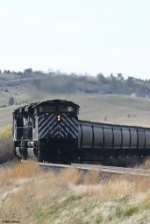 Description: Mid-train on unit grain train. Description: Combined Helper units drift back to Helena. Description: C-SPBBKM climbs out of Helena with helpers in the middle & bringing up the rear. Here, it's grinding into the grade towards Birdseye. Description: The 4313 gets washed at Helena. Taken with permission from MRL. Description: Led by MRL's only true SD40-2, seven Helena Helpers race eastbound. Description: Cough cough.... I may only live to 60, but it was worth it! Description: A coal train with an eclectic consist. BNSF DPU's 9246 and 6130 shoving on the rear. Description: A set of helpers shoves on the rear of this westbound autorack train just west of Helena as the train heads to Mullan Pass. Sometimes helpers are placed mid train. Description: Helper 3 assists the coal drag west.